Ever wonder about coin collectors from a long time ago? Well I never did until I came across this book and purchased it. It is a fascinating window into, or--to use the title-- a mirror upon coin collecting in Kyoto in 1842. I have reproduced the book in total at this site. Below is the cover of Kokin kousei, Shinsen zeni kagami (Corrected Against Past and Current Records, A New Selected Mirror of Cash Coins). 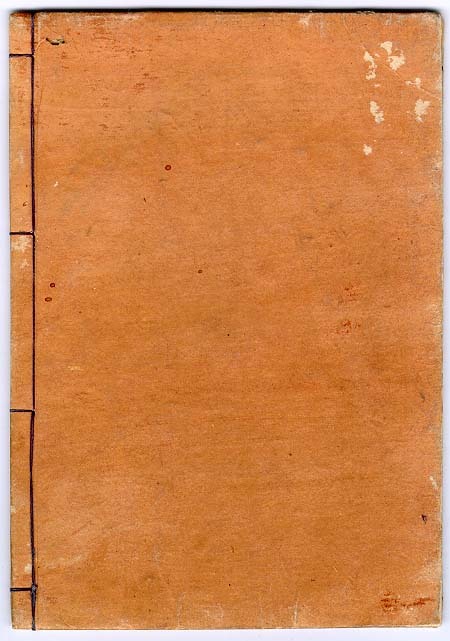 It was published in three parts but bound together here (21.7cmX15.8cm), perhaps by the purchaser. 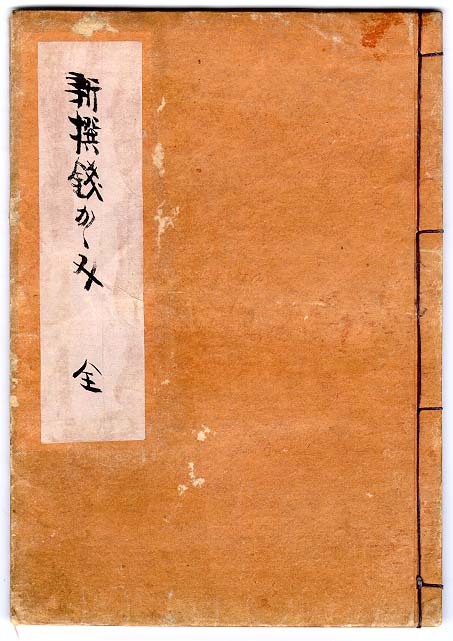 The colophon of part one states that it was published in the summer of 1842 by Nakamuraya Touji. He was a store owner dealing in old coins and his store was in Kyoto, the address being Shijou Takakura nishiiru (downtown near the Daimaru store in present day Kyoto). The name of his store "Touhenboku" is a sophisticatedly comic name. Tohenboku refers to a person who cannot understand what is going on--or who pretends not to understand anything so he can get his way. The book is mainly just a price guide for cash coins and cash-shaped charms. How much were certain coins worth in Kyoto in 1842? This actually is quite interesting historically. The relative values of coins are very different than today. Some coins which are quite common today were then quite valuable, and some coins quite common then are quite valuable today. This reflects different patterns of circulation creating different scarcities. This book is evidence of that there were many coin collectors back then. Woodblock print books in Japan were published in runs of around five hundred to a thousand. They were made from carved blocks of cherry wood. Hiring the carver and printer to make these books would not have been cheap. Presuming that Mr. Nakamuraya wanted to recoup his investment we can surmise that there were at least many hundred collectors in the Kyoto/Osaka area. Indeed that he could have a store specializing in old coins bespeaks a lively community of coin collectors as well. Some person who owned this before me has penciled in some English translations here and there. They are not always correct but I have not erased them because I do not want to do further damage to book. The red markings on some pages are from a much older Japanese owner and seem to be comments on which coins he possessed. A coin collector friend, Sam Leung has provided me with images of another similar book but which is 43 years older yet, Kosen nedantsuki, and has allowed me to make a page presenting it. Check it out if you like this kind of thing. Because each page file is a large JPG (around 200K each) I have made a separate web page for each of the10 pages of the book. Use this bar to navigate to the page you want. Use the cover image in the green rectangle to navigate to this page.